There is something about stuffing in the food world that makes meals so much more exciting and appetizing. Sure eggplant and butternut squash are great, but stuffed eggplant and butternut squash? now your talking! Whether your stuffing a turkey or serving some plant-based inspiration this season, these ideas can be enjoyed by meat-eaters and vegans alike. 1. Bring amaranth and water or broth to a boil, then let simmer until water is absorbed (should have a porridge like consistency). 2.Cut butternut squash lengthwise and scoop out seeds. You can also hollow out more of the squash above the seed opening to fit in more stuffing. 5. Stuff the butter nut squash and bake on a baking sheet or glass dish at 375 for 35-45 min unil squash is soft. 6. For green beans, snap stems and steam in a large pot until crisp tender. Toss in 1 tbs lemon juice, 2-3 tbs olive oil handful of chopped dill, salt,pepper and capers if desired. Top with pumpkin seeds or sliced almonds. Preheat oven to 350°. Heat oil in a large frying pan over medium-high heat. Add onions, garlic, and salt. Cook, stirring occasionally, until onions are soft, about 3 minutes. Stir in sage and cook until fragrant, about 1 minute. To make your flax egg, add two tbs flax seeds to ½ cup of water in blender, blend on high until emulsified. 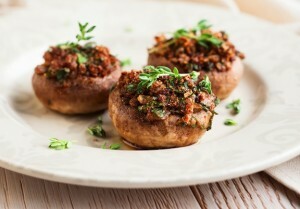 For stuffing, in a large bowl, combine the nuts, onion And ½ cup nutritional yeast with the flax egg. 1. In a medium pot add rice, water or broth and salt. Bring to a boil and then simmer until water is absorbed. 3. Toss with oil, herbs salt and pepper and place on a baking sheet and bake for 25 min until eggplant is soft. 4. 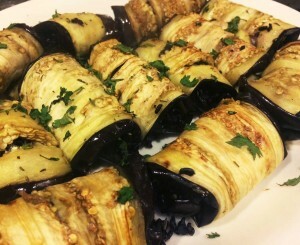 Place 1-2 spoonfuls of rice on one end of the roasted eggplant strip and gently roll up.